First of its class and one of a kind, Sunreef 58 luxury charter catamaran IN THE WIND brings styling and technology to the next level. Based upon the knowledge of design and engineering that has made previous Sunreef hulls so successful, IN THE WIND has achieved remarkable levels of comfort, efficiency, stability and seaworthiness. IN THE WIND features contemporary interiors with an Asian flare. Rich, dark wenge wood provides a dramatic contrast to paneling, ceiling and floors in a palette of soft white shades. Vibrant crimson accents enhance the elegant simplicity of this luxury charter catamaran. Innovative use of space allows guests the comfort of relaxing, socializing or dining in any area. IN THE WIND’s chic atmosphere will exceed expectations with creative furnishings that include a discrete low-rise table and deep, roomy sofas, reflective of traditional Japanese furniture arrangements. Inspirational views through the panoramic windows allow guests to relish the beauty of sailing even from indoors. A focal point for entertainment on board crewed sailing catamaran IN THE WIND is the open, professional galley opposite the salon. The galley is fully equipped with high end appliances, ample counter space and plenty of storage. Open and accessible helm stations located in the main salon and on the flybridge welcome guests to pour over navigation routes and charts, plot courses, locate destinations and converse about the finer points of sailing. Outdoors on luxury sailing yacht IN THE WIND, guests will discover the exhilaration of high performance sailing and understand with true appreciation the impeccable detail of this iconic catamaran. The optimal hull ratios of IN THE WIND and lightweight construction using vacuum infused, high-tech composite materials, makes extraordinary stability and speed possible. 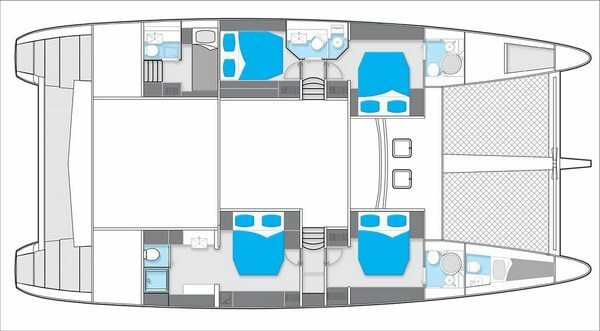 Both the flybridge and the aft deck on charter catamaran IN THE WIND provide elegant options for outdoor living, alfresco dining, sunbathing, or relaxing in the shade. Aft deck LED lighting from above adds an ethereal twinkle to evening cocktails or a gourmet repast. Crewed sailing catamaran IN THE WIND has a variety of water sports toys and activities to suit guests of all ages and abilities. Take advantage of the many options that include; water skis for both adults and children, single and double kayaks, snorkeling gear, fishing gear and inflatables. The professional crew of three aboard Sunreef 58 IN THE WIND is dedicated to customizing the perfect charter for their guests. Their knowledge of the region, their sailing competence and their unfailingly generous personalities has resulted in an esteemed reputation that accounts for the loyalty of their repeat charter clients. For an unforgettable vacation on board a luxury performance sailing catamaran, IN THE WIND is an optimal choice. Please contact us for more details on her availability. - This includes dives for certified divers only. - Up to a total of 5 dives per 7night charter. - All gear rental is included. - We can only take four divers per dive. All food, beverage and fuel is included. Note, the crew budget at $75 per head per day. If guests have special requests for premium wines etc then we will add an APA to the rate. Rate for this period is $37,500 USD all incl terms as above.